I'm sure you've all been on the London Underground, squeezed in there with other tourists, commuters, shoppers. It's crowded, the tunnels are narrow, the stairways cramped, there is no air conditioning. It's old. It's almost as bad as the New York Subway. Like much else British it is the way it is because we were there first. There is a price to being there first. It can make it very difficult and expensive to update. In the case of the London Underground updating; which would basically mean enlarging, that is almost physically impossible without closing entire lines down for years at a time. Britain in short, pays the price for being what economists call an 'early adopter'. You have a great advantage for a few years and then you are stuck with a creaky system with clunky technology when everyone else is whizzing ahead with continual updates. That's why you can breathe on the Lisbon and Porto metros and practically every other mainland European metro system. The same applies to politics and societies. Whether their intangible nature makes them any easier to update than the London Underground though is another matter. Britain modernised very early, compared to other European countries. The country was effectively unified during the Medieval period, restraints placed on the absolute power of the monarch by the aristocracy and the courts from the late Medieval period onwards with an early model of a parliament dating from the same time. The fact that we went in for a level of beheadings and burnings at the stake that would make even ISIS/Daesh blanch should not obscure the fact that Britain (or more correctly England+Wales) developed a set of institutions and a truly national culture earlier than almost anywhere else in Europe. Britain does not have a constitution as such, which must seem odd to everyone else, especially those Americans who wave theirs around as if it was a document handed to them by the Almighty. The set of laws, rules and yes, that great British favourite, the 'Gentleman's Agreement', that make up what amounts to a constitution has evolved organically over time. In some ways this allows for flexibility, and in the days when everyone behaved in the establishment like a gentleman this was fine. However the system does not cope when politicians are intransigent and ideological as they are now. The British system is essentially 'presidential', i.e. the Prime Minister has the power and Members of Parliament follow the party line. There is no expectation that Parliament takes the initiative, so when they have done, as now, there are no rules, and the ship of state is left drifting and rudderless. I had a German friend on the phone the other day, laughing about the British Parliament: the hard benches where MPs have to sit crammed next to each other, the way the benches are opposite each other encouraging confrontation, and in particular how they all shout at each other, and occasionally bay like packs of feral dogs. To her, it seemed all so antiquated. Indeed, she was pointing out a painful truth. And the place is falling apart and needs a massive physical overhaul, never mind constitutional. Most Brits don't realise this, or they moan about the bureaucracy they do have to cope with, but the UK has less form-filling, standing in line in government offices, or regulation than any other industrialised country. To take just one example of this. In most countries if you want to become a builder you have to have some sort of certification before you start ripping the roof off someone's house or replacing their windows. Not in Britain, where anyone can call themselves a builder and start selling themselves as such. The country has been, and in many ways continues to be, remarkably open: tourists and other foreign visitors have long been able to show up at hospital and get treated without being handed a huge bill, send their kids to school with no questions about their right to be here, and even open businesses and start trading with minimal bureaucratic intervention. The ultimate aspect of the absence of bureaucracy is that we do not have identity cards. This is regarded by many Brits as a sign of our 'liberty' and indeed superiority over foreigners who are somehow seen as less free of their government because they are expected to carry a little card with them all the time. When the last Labour government proposed introducing them, the reaction from many people was nearly hysterical, as if some fundamental right was being taken away from them. Not unlike the reaction of those in the US who resent any action of government. The lack of identity cards masks a more fundamental problem. The British government does not know who the **** we are. There is no list of citizens. In fact we are not really citizens at all. There is an electoral register (i.e. who can vote), passports (but if you didn't travel you wouldn't have one) and National Insurance numbers, which are about working and tax payments but there has never been a register of British citizens as such. So in fact, government does not (or did not) really know who had a right to be here, and who didn't. This relative absence of bureaucracy is actually rather nice, but the problems begin when government decides to tighten things up. Which is what has happened to thousands of people who came here, mostly from the Caribbean in the 1950s and 1960s. They entered the system but because there is no register of citizens they were unable to prove their right to be here when the government decided recently to start demanding increased documentation to access government services, largely to pander to their racist right wing that they were being tough on immigration. Hence the Windrush Scandal, referring to one of the early Caribbean immigration ships. Deportations of elderly Caribbeans began, and a cruel wave of bureaucratic persecution of mostly Black British people. All carried out by what we quaintly call 'The Home Office', but known as the Interior Ministry everywhere else. This government department is well-known for its incompetence, indeed a government back in 2006 described it as “not fit for purpose”. And as the Windrush Scandal has illustrated is staffed by people who lacked the moral conviction to question the measures they were asked to carry out. If a latter-day Hitler arrived on our shores, you can imagine the Home Office meekly carrying out his orders. Brexit may be destructive, irrational and embarassing, but the Windrush Scandal has been so deeply shameful - the racism and simple inhuman cruelty of it all. To be very ironic, one can imagine some old colonel type snorting into their whisky and soda, “terrible business, terrible business, British government behaving like a bunch of ****** foreigners”. Shameful but not perhaps, surprising. I'm saying 'English' here as this may well not apply to the Welsh and the Scots, who after all have the English to cope with. Every country and ethnic identity is racist, that's part of the human condition. But it takes particular forms and selects particular targets in different places. What is odd about a lot of English racism is that it is not directed so much at black or brown people but at other Europeans. All part of 'the island mentality'. It may be difficult to appreciate this in the cities, but with conversations with people out in the countryside it begins to become apparent that there is a deep level of suspicion verging on the paranoid about what is always called 'Europe' – as if we were somehow on another continent. Around 15-20 years ago, British agriculture suffered two major blows from animal health problems: the BSE (mad cow) crisis and The Foot and Mouth Disease Crisis (this refers to a disease of cattle, not the ability of our politicians to open their mouths and put their feet in). Arguably both were exacerbated by political cowardice at the top and the incompetence and rigidity of the civil service department concerned. In both cases, other European Union countries were quite keen to keep diseased British livestock or contaminated meat out. The tone in the countryside was that all this was yet another plot by 'the Europeans' to destroy British agriculture. Suspicion of 'Europeans', specifically France and Germany, runs deep. The EU is seen as a Franco-German plot, targeting Britain. Both the old enemies lined up together. I am sure you have all watched Dad's Army, the very best of British comedy (let's face it, one thing we are good at, is comedy); there's that little bit at the beginning where the arrows with Union Jack flags (otherwise known as the Butcher's Apron) are facing off the arrows with Nazi swastikas are on the European mainland. This mentality runs deep. The last few years have seen a run of films about Churchill. Mostly very good, very enjoyable and informative. But why? The History Channel on the TV is widely known as 'the Hitler channel' because mostly seems to be about the Second World War. It's like it's the last thing we felt we could be proud of as a nation. There is so much more: our amazing explosion of popular music from the 1960s on, an incredibly successful, and very largely harmonious multi-cultural society, our leading role in art, cinema, fashion, literature. All of which was exemplified by the opening ceremony of the 2012 Olympics – which felt like the finest hour of the new Britain. And indeed we do have a wonderfully open society.... just the thing we are in danger of losing right now. Thinking of a nation as having software (culture) and hardware (institutions), it is clear that the British software is changing but the hardware is utterly outdated. The 'wogs begin at Calais' attitudes I've talked about are very largely generational. Young Britons are far more European in attitude, and remarkably open-minded about all questions of diversity. Our society has become more complex, more demanding, with higher expectations of ethics and transparency than the political and bureaucratic superstructure that our past has bequeathed us is capable of offering. Those institutions relied a lot on social deference and a democracy that was managed by a narrow elite. No wonder we are in a mess – these institutions do not offer a way of managing and governing a complex and sometimes conflict-ridden modern society. We need a big overhaul. Porto in northern Portugal is the city of the camellia. The public parks and people’s gardens are full of them. For those of us who are only used to seeing them as head high, or maybe in Cornwall, up to the first storey, these are huge. And the city clearly loves them. Last weekend, the city council put on its annual camellia festival. |n an underground metro station! Very Porto. And wonderfully democratic. It ran all weekend, with talks and events as well as lots of round tables with flowers provided and arranged by parks, private growers and nurseries. It was not that easy to guess who was there deliberately and who was just passing through. It was a great way of making everyone look at the trees which are so much a part of the city, and appreciate the amazing genetic diversity of the plants, not just the different flower colours and shapes but also the different foliage qualities. Everything meticulously labelled. There must have been several hundred cultivars on display. Some very familiar names, such as ‘Capt. Raffles’, which i think was the first to flower in Britain, named after the sea captain who would have been paid to look after the plants on their long voyage from China. In fact the first were probably imported by the Portuguese who were the first Europeans to visit Japan. They would have flourished here, in a climate not dissimilar to southern Japan. Most cultivated camellias are derived from just a handful of species. Modern breeding, particularly in the US, is bringing in genes from many more species, often only recently introduced from China or Vietnam, and new to cultivation. The flowers on the left are Higo varieties, bred, mostly, I think, in the US from varieties originally bred by the Higo clan of Kumamoto on Kyushu in Japan. A minority of those on show were Portuguese bred; but I met several growers who wanted to collect only Portuguese ones, many of which are old and quite rare. Of course, it being Porto, there has to be an artistic element. The skirt here is made of imitation azulejos, the blue and white tiles which are a particularly Portuguese art form. And there has to be music. Performers provided accompaniment from the steps of the station. And finally, this is how big they get! 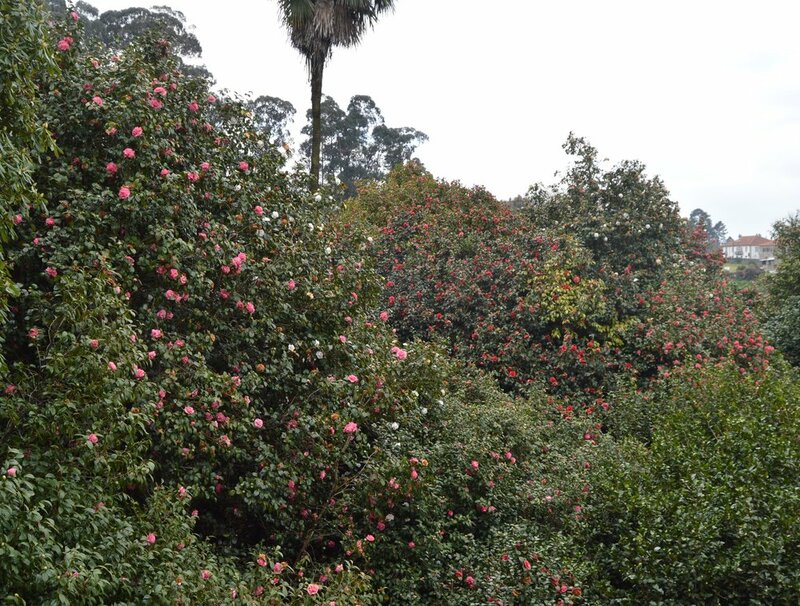 A picture taken from the upstairs of Mosteiro Landim, one of three camellia gardens we visited at the weekend. Some are kept clipped, others are allowed to grow enormous. Whereas we tend to be used to them flowering in a burst in spring, here, in milder winters they can flower off and on from December onwards. Blog roll: from Spain: Arañazos en el Cielo, Miguel Recio’s thoughtful blog about gardening and gardeners and El Blog de la Tabla. From los Estados Unidos we first have to mention the beautifully-illustrated View from Federal Twist, James Golden’s tales and images of gardening in the New Jersey backwoods and then Thomas Rainer’s Grounded Design - essential reading for all concerned with making our landscapes more sustainable and more planty. From Canada, Tony Spencer’s The New Perennialist is a must for lovers of contemporary planting. I can get terribly engrossed by the Garden History Girl blog, and in a similar, fascinating and well-researched vein is some LANDSCAPES. Welcome to my blog. Please note that this is my new blog site, but I am still using my old one: noels-garden and that is where you should go to access previous postings etc. I hope you’ll agree this one shows off pictures much better! I also now blog monthly for Learning with Experts - this is more practically-orientated and entry-level, but always with little bit of detail on plant and garden history, ecology etc. The irony though is that the vast majority of the plants here may be native to the Mediterranean region but very few of them are in cultivation. They are available from the nursery here of course, but in many cases it is Olivier who has pioneered their use in cultivation and their commercial production. He and Carla have spent a lifetime traveling throughout the region studying plants and habitats. Probably more than anyone else Olivier understands how plants survive the interactions between drought and soil in the region. So it is actually quite shocking to realise just how stereotypical many Mediterranean planted environments are, and/or dependent on irrigation. Mediterranean gardens are dominated by a classical model based on the formal clipping of a limited range of species. There are good reasons for this - it is not just an exercise in conspicuous consumption as some northern Europeans think (the ‘look at the all gardeners I employ’ model of horticulture). 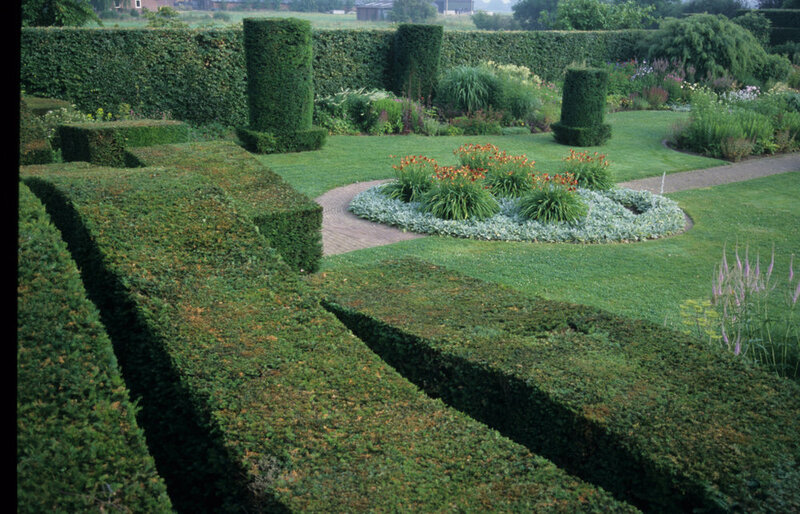 Clipping is a way of giving meaning to the amorphous shapes of the limited number of plant species that stay green through the summer. Increasingly though people are criticising this model and turning instead to the aesthetics of wild landscapes. The vegetation of wild landscapes does not have a high status here. Traditionally the maquis (or macchia, matorral, matos or whatever) is seen as a source of herbs, honey, hunted wildlife and firewood and given no value for itself. Given that these are very tough drought-tolerant plants, it is natural that Olivier and other practitioners of the new Mediterranean gardening should turn to the. There are simply so many grey-leaved, tough, twiggy, compact shrubs (or sub-shrubs as they are often called). Convergent evolution has resulted in many different unrelated species developing similar characteristics. Thinking as garden designers, there may be a similarity of form and texture, but there is huge variation in texture. Gaps can be important part of the visual aesthetic, just as in nature many of these plants grow in environments where there are considerable gaps between plants. The visual qualities of the stone or other substrate is of course important. Gaps play a role in habitat diversity too, places for spring-flowering bulbs or annuals to grow or simply the space around planting allows us to better appreciate the planting. Grasses (tough tight clump-formers, i.e. cespitose) species are one of the most effective contrasting forms to the default ‘grey hummock’. This scene is a typical example of the big gap in plant size between developing canopy trees (mostly stone pine, Pinus pinea) and a ground-hugging understorey. Its very attractive as well as a frequently occurring situation. There is a lot of seeding going on, for example of these Euphorbia species here. Many of these plant species are relatively short-lived, which means that to survive they have to seed. Allowing, encouraging, but also managing seeding is an important part of habitat-based planting styles and to be honest is the barriers to wider adoption. Effective management of plant reproduction and replacement is a key part of how these plantings are looked after, skills which are not immediately obvious and which need to be communicated to those at the sharp end of maintenance. Many of the grey hummocky plants are short-lived, in that they are naturally part of early succession communities, to be eventually replaced by trees and larger shrubs. That is happening here, as almonds and strawberry trees (Prunus dulcis and Arbutus unedo) are gradually establishing. As so many of us know, lavenders and cistus begin to deteriorate after a few years, they may live for 20 years plus, but if a large part of this is as scrubby rangy specimens many of us would rather not know. Annual light pruning helps keep them in shape. Such pruning is a vital part of maintenance but again, needs to be communicated effectively to those who wield the clippers; only light pruning is needed, not the ‘meatball’ pruning so often seen in public landscapes. The amount of research that has gone on here is incredible. Much has been written up in Olivier’s books: Planting Design for Dry Gardens, and Bringing the Mediterranean Into Your Garden: How to Capture the Natural Beauty of the Mediterranean Garrigue. The nursery stocks a huge range of plants, and is amazingly tidy and organised. I’ve had a nursery myself and I know how hard it is to keep it this way! Olivier is actively researching plant propagation and keeps notes on a huge range of plants, all to be written up in another book one day. One final thing. These plants, of lean-and-mean habitats, survive and flourish on well, lean and mean soils. They don’t like irrigation, or any unseasonal watering. They offer their services to those who can provide them with the right habitats. Those on moister and fertile soils will not have so much success! Here’s the link to the information-packed nursery website. Why is Britain in such a mess? What was once a 'strong and stable' and safe country seems to be descending into the chaos. Why did my (African heritage) taxi driver in Copenhagen say recently “I don't know much about England but I know it's a country where bad things happen”. He was referring to the terrible fire at Grenfell Tower, which he assured me could never happen in Denmark, or if it did, the government would have to instantly resign. The squabbling, back-stabbing and abusive tone of parliamentary politics looks more and more like what we used to expect from countries which the Brits used to rather look down on. It's now us being looked down on by the rest of Europe. The answer, I believe, is that we now lack a culture of consensus, and have lost our means of building and developing one. Instead, divisions seem to get magnified and deepened. The Brexit referendum and the increasing ideological polarisation in both main political parties are a sign of this. Other north European countries have some sort of culture of consensus. The Scandinavian countries in particular have a very strong culture of consensus in politics and around socio-economic issues. This has undoubtedly played a major role in their extraordinary economic success and the high quality of life of their populations. The Dutch are pretty good on consensus too; you have to be if the sea is always threatening to come gushing over the dyke. It's not something which is so often associated with Germany, but there is little doubt that German politics and decision making relies heavily on consensus, powered to a large extent by the results doled out by the electoral system which forces political opponents to talk to each other. Right. That's one clue as to what is going on. Britain is about the only country in Europe with a primitive 'first past the post' electoral system. It tends to end in 'either or' results, and we used to believe that the resulting alternation of political parties in government was a good thing. However it also encourages divisiveness. Anyone who has heard the British Parliament on the TV or radio tends to be rather horrified by the level of shouting and jeering going on. Even the geography of the place seems to encourage this, with two 'sides' on each side of the house; most other European parliaments have horseshoe or semi-circular shaped assemblies which discourage such binary confrontations. In fact once you start to look around, there are quite a lot of binary oppositions in British society. The legal system for a start: prosecution and defence locked into trying to persuade the jury of the rightness of the case they are being paid to defend. They may not believe their clients but their job is convince through their rhetoric or their skill in demolishing their opponents. Any idea of impassively and objectively seeking the truth is simply not part of the business. And then there is the institution of the debate, a key part of the elite Oxford and Cambridge student 'unions' and mimicked in the so-called public schools (they are actually private). Debates between two oppositions encourage black and white thinking, there is a failure to appreciate subtlties or any encouragement to negotation or consensus. Lots of binary opposition then. No wonder no-one can agree on anything. But why has this developed only now? For the answer we need to look back at history. England had a nasty civil war in the 17th century. King Charles I lost his head, and so did many others. This came after some vicious disputes over religion, lots of burnings at the stake etc. The solution seemed to be a historic compromise achieved in 1688 when the Dutch William of Orange took the throne after a palace coup (British version) or a Dutch invasion (Dutch version). Monarch and Parliament agreed a compromise, a division of powers and religious toleration (of a sort) was agreed. Ok, Catholics were still second-class citizens, as were dissenting Christians, but the killings, the burnings and the torturing stopped, and one of the defining characteristics of the true British gentleman came to be a phlegmatic tolerance, part of which was a strong presumption against political and religious 'enthusiasm', which in those days was understood to mean what we would now call 'passion' or 'evangelism'. For the next three centuries this held pretty well. The historic compromise became part of the ethos of an effective and relatively tightly-knit ruling class. Disputes and disagreements could be aired, but always within the constraints of a set of rules of behaviour strictly controlled by the elite – who all went to the same schools, played the same games, read the same papers and tended to marry each other. This elite was always flexible, with newcomers such as vulgar industrialists, religious dissidents successful in business and valuable members of minorities (i.e. Jews) were never excluded for too long and eventually invited to join. The rough and tumble of parliamentary debate was between men who were basically all part of the same club. Politics in Victorian England may have been a constant ding-dong between two men who hated each other (William Gladstone and Benjamin Disraeli, the latter a Jewish convert) but who agreed the ground rules. Fast forward to the end of the 20th century and the elite consensus that managed the binary oppositions starts to fall apart. Comprehensive education sees a watering down of the elite, large-scale immigration is rapidly followed by much breast-beating over racism, followed slightly less rapidly by second-generation immigrants making it big in business, media and politics. No longer is the old elite able to manage the tensions inevitably created by binary oppositions, particularly since the electoral system does nothing to encourage politicians to agree with each other. Increasingly there is a 'new Britain': multi-cultural, happy with 'difference', globalist, innovatory, outward-looking, and an 'old Britain': unhappy with change, nostalgic about the past, frightened of the future, unwilling to douse its fish and chips in curry sauce. There is nothing to encourage these two cultures to talk to each other. 'Old Britain' would like to carry on running the consensus in the way it used to; 'New Britain' wants a different, and much wider, consensus. Few people are now really nostalgic for empire, although a great many don't realise just what a hideous mess it often left behind, but why are we so obsessed with what is called 'the war', i.e. World War 2: films about Winston Churchill, TV history programmes, recycled wartime government posters etc. Nostalgia seems to have become a big part of British public life. Nationalism and sectarian politics feed on nostalgia like vampires feed on blood. Nostalgia helps/ed fuel Vladimir Putin, Donald Trump, Narendra Modi, Daesh/ISIS and all the other thugs and bigots who currently seem to afflict us. One outcome of the inability to compromise in Britain, has been the 'austerity' economics practised over the last eight years. More than anything else this is what is driving so many people into poverty (20% now below the official poverty line), is degrading our health and education services, shutting museums and libraries, causing our physical infrastructure to break up and much much more. Systems that encourage politicians to talk to each other, even do rather sordid little pork barel deals with each other tend not to end up condemning so many to suffer such a long period of neglect. Northern Ireland is an interesting and hopeful example of how people who hate each other can be made to talk and to make deals. For years this small province (1.5million people) suffered a low-level civil war, the result of centuries of historic mismanagement by the rulers in London; with two communities at each other's throats - I think the word 'tribal war' would be used if we were talking about Africa or the Middle East. But, as part of a series of reform measures, the British government introduced what they have never dared to do at home, a proportional electoral system. No longer could local councils be dominated by one (inevitably sectarian) political party. You may be wanting to kill each other, but you still have to decide when the dustbins are going to be emptied. Behind the scenes and then more openly, the enemies talked over the boring minutiae of how to make basic services work and then found they could talk to each other about other things too. And two of the biggest enemies, an ex-guerrilla leader (Martin McGuiness) and a sectarian politico-religious leader (Ian Paisley) ended up as back-slapping best mates. Now of course, the delicately-constructed good example of communal healing in Northern Ireland is threatened with being derailed by Brexit. That would be a savage irony, as it is the one place on this increasingly divided set of islands where there has been real hope, led by a fairer and pragmatic electoral system. So there, that's my analysis. Condemned by being unable to move on. A sense of complacency about our past and our antiquated institutions has led us to be unable to see how to heal new divisions. In particular an inability to develop an electoral system that helps build consensus. Something, I might add, that the United States, another country with a once admired political system, but now also brought low, might take notice of too. Portugal Centro Region - the front line of climate change? Quite a lot of the region now looks like this. Fire damage plus the results of centuries, even millennia, of soil erosion. You want to know what impact climate change will have on landscapes? Come to the Centro Region of Portugal and take a look. Having spent some months in the region, I really feel on the front line of climate change. I have blogged before about the devastating fires the area has suffered from (see here and here). These however are just the latest in a series of destructive impacts that go back a long way historically, which make the landscape of this area a particularly alarming example of what can happen over long periods of time, with contemporary climate change contributing a final blow. One of the odd things that one notices around here is the areas of bare ground, not just solid rock but gritty bare 'soil'. Rainfall is pretty high here (at least September to April), so this apparent 'desertification' is a bit of a mystery. There are places where it seems entire hillsides are bare of vegetation. In other areas, such as around the village where Jo and I are currently living, the fires have revealed more bare soil beneath the blackened trees. Unpacking what has happened has taken some time. The Alva Valley. Much of what you see here is actually bare - eroded rock. Much of the region is granite, which produces gritty infertile soils. But the climate is mild and rainfall plentiful so human populations have always been high, with some areas having remarkably high densities of villages even in the pre-Roman period. Lots of people meant deforestation plus lots of grazing animals, so tree cover began to be lost from pretty early on, to be replaced by heather, gorse, broom and other low woody plants. Grass, the most thorough protective skin for soil, does not grow particularly well as the soil is simply lacking in sufficient phosphorus and nitrogen. Soil erosion, driven by heavy winter rains, gradually stripped hillsides of anything the grass could grow on anyway, dumping it in the valleys (which at least helped peasant cultivators). The remaining grit, almost entirely stripped of humus or finer soil particles can now only support thorny shrubs (mostly pea family) or annuals. This is the situation on much of the Serra da Estrela, the highest hills in the region: once high pastures, now looking like semi-desert. The Serra da Estrela. A lot of bare rock plus low semi-desert shrub flora. And this gets very high rainfall. Many overpopulated European landscapes were saved by the safety valve of emigration to the New World in the 19th and early 20th centuries. There was relatively little emigration here though, so the pressure of deforestation and grazing built up. By the mid 20th century, the government (the Salazar dictatorship) recognised the problem and began to promote reafforestation, but not with the original oak and chestnut, but quick growing pines, and then eucalyptus. As with so many other hilly places in western Europe, rural depopulation emptied the countryside. Here the climate made the industrial planting of eucalyptus an increasingly attractive investment both for the corporate sector and anyone with a few hectares who wanted a reliable pension fund. Given that the landholding system is such a mess (ownership of something around 20% of the countryside is disputed), 'guerrilla planting' of eucalyptus is rife. Eucalyptus globulus is a tree which evolution has designed to burn ferociously, scattering red hot embers for kilometres downwind. Whereas strawberry trees (Arbutus unedo) resprout impressively from a burnt stump and cork oak (Quercus suber) from all over the branches, this particular eucalyptus sends out vast numbers of new shoots all the way up the trunk, and surrounds itself with its seedlings. The tree is able to generate a cycle of burning which eliminates pines, its main competitor, and over time would eliminate any remaining oaks or chestnut, which do not burn but grow much more slowly. It was interesting to go to Tasmania in the spring and see Eucalyptus globulus in the wild. Australia's landscape history saw eucalypts gradually displace other slower-growing tree species as the Aborigines used fire as a landscape management tool; assisting the mass extinction process which tribal hunter-gatherers caused all over the world during the Stone Age. There the process took millennia to complete; in Portugal it is taking just a few decades to go much further and completely degrade the landscape. Wild eucalyptus in Tasmania grows quite sparsely, in multi-age stands; in Portugal, even-aged plantations pack the trees in as densely as possible, so the amount of highly inflammable biomass is concentrated far more than would ever happen naturally. 'Desertification' is not an exaggeration to describe what is happening. The firestorm of last October, the worst landscape fire globally in 2017, was a qualitatively new experience for Europe, an event which was almost certainly climate change induced and which is now far more likely. Although fed by eucalyptus, I could imagine conifers feeding a similar event in the right set of circumstances (high wind velocity after a long drought). What has happened to this region should be a warning for other places. This is of course the era of conspiracy theories and fake news, and so of course a variety of paranoid fantasies have unfortunately taken hold, which do nothing to help target the blame where it belongs: the corporations who produce chipboard and paper pulp from the eucalyptus and promote its growth and the ineffective government. There is a group called 'Ceus Limpos' (clean skies) which is propagating the daft idea that drones and planes spread the fire deliberately. As if the region does not have enough problems already! One further impact is a psychological one. We have lived for several months this year in a devastated landscape. It quickly becomes the 'new normal'. Local residents still talk about good walks in beautiful places as if they are still there. After being here a while it is almost a shock to go somewhere undamaged, even to take a walk in an ordinary pine forest with a bit of heather on the ground seems so refreshing. A way forward? Really only the replanting of native oaks and chestnuts, from the evidence around us, it would seem that decent stretches of these trees would be very effective as fire breaks, and would do more to build up the soil than plantation eucalyptus. There are some organisations working around this. https://criarbosques.wordpress.com/ Paulownia is being touted as an alternative to eucalyptus for smallholder plantations; though an invasive itself in some parts of the world, it is at least deciduous and doesn't burn too badly. Ultimately though this is a political problem, to break the stranglehold of the pulp and chipboard industry over the government, an industry it is worth pointing out, that brings in a declining proportion of national income compared to pretty well every other timber producing country in Europe. Paleo história e história antiga das florestas de Portugal Continental − Até à Idade Média Carlos Aguiar e Bruno Pinto. Available here. Portugal em Chamas - Como Resgatar as Florestas, João Camargo, Paulo Pimenta de Castro, Pub: Bertrand. Available here as an e-book, as well as conventional. Also see MAAVIM as an example of local action. And even if you don't read the language, this is a good and powerful photo-essay, more about the human impact, and at the end a very good map that gives you an idea of the scale of the disaster of last October.